For those with memory loss, many things are uncertain. Simple moments that may have been taken for granted become both meaningful and comforting. Setting the table, and feeling the familiar shape of each plate and platter. Tending to the garden, and catching the scent of a rose. Reaching out for a hand, and finding that another's is there to grasp. At Springhurst Health Campus, our team is dedicated to treating each moment, and each person, with respect, patience, and understanding. In our Memory Care neighborhood, seniors and their loved ones have access to specialized programs and compassionate support, from people who understand that every story is unique, and every story matters. 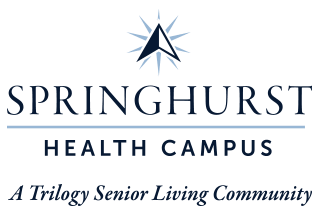 At Springhurst Health Campus, caring for those with memory loss is both the purpose and the passion of every member of our team. Our care and activities are based on personal preferences and histories, and our Daily Rhythms program is based on protocols embraced by national Alzheimer's advocacy groups. We believe in treating the entire person, which means caring for their spirits as well as their minds. At our campus, clinical support and empathy always go hand-in-hand. During a memory loss journey, short-term memories fade, while long-term memories remain. By celebrating those memories, as well as the people who made them, we can create experiences that bring smiles to the faces of every senior we serve. We've seen the eyes of an avid fisherman light up when he's back on the water with a rod and reel. We've watched celebrated bakers swell with pride when they serve up a dessert they've helped to make. Our Memory Care neighborhood is a place where our residents can find joy, both in memories that have passed, and in present experiences. If you’re looking for Memory Care services you can count on in Greenfield, give us a call today.